The Touch Massage Panel was the idea of Darren Horn and Peggy Dawson, who provided Touch Massage for many people living with HIV and AIDS, both in the hospital and their homes. The daisies were a favourite flower of Darren’s. 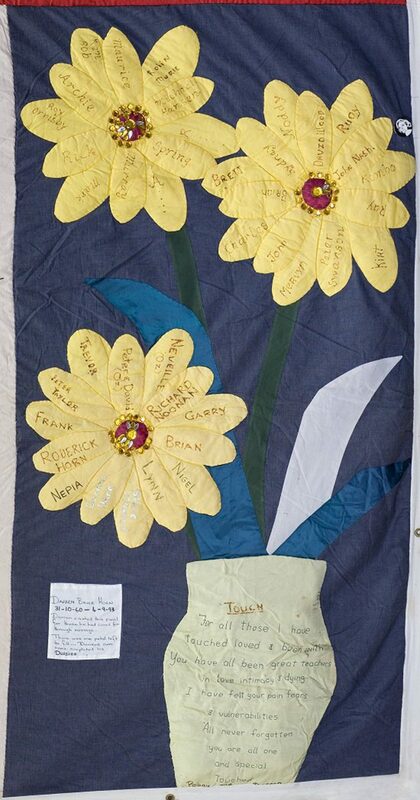 The petals carry the names of people either Darren or Peggy worked with. The jewels are for the preciousness of each person. Darren has since died of an AIDS-related condition himself (4 September 1993), and it is difficult for me to know exactly what he would have said, or wanted to say about this panel. Perhaps, that each of the people it was his privilege to have encountered enriched his life and assisted him with his own journey. Darren Horn (September 1993) and Stephen Maxted (May 1993), his partner, fill the final two petals. Darren and Nicki holding up the newly completed ‘Touch Panel’.